Spot the mistake in the first sentence of this Independent story and judge for yourself if it affects the thrust of the first paragraph. The other day, public booking opened for this year's Aldeburgh Festival. Helen Hayes, who runs a recording studio at the nearby Potton Hall with her husband, dashed to her phone, hoping to book seats to take their small son to hear the City of Birmingham Symphony Orchestra conducted by Sir Simon Rattle. It wasn't to be. "I've just tried to book for the CBSO Rattle concert and it is sold out – before public booking opens!" she declared on Facebook, adding: "Talk about access to music... and they get most of the public funding for music in this area. Elitist? Classical Music?" To help you spot the mistake here are two clues. The first is that the story ran on 11 February. 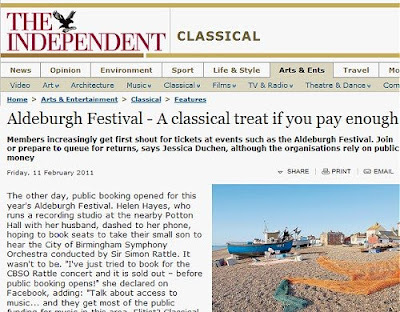 The second is this copy, which was one click away from the story's author and the Independent sub-editor on the Aldeburgh Festival website. We are currently accepting bookings from Friends (from 31 January). Advanced Booking opens from 22 February; General Booking will open on Tuesday 8 March. As Norman Lebrecht told us "until bloggers deliver hard facts … paid for newspapers will continue to set the standard as the only show in town". More on the Independent's standards here.